Cosmic Reality will change you. "This is your last chance. After this, there is no turning back. You take the blue pill - the story ends, you wake up in your bed and believe whatever you want to believe. You take the red pill - you stay in Wonderland and I show you how deep the rabbit-hole goes." - movie The Matrix. I fell down the Rabbit Hole the day they assassinated President Kennedy. This book is 50 years in the making. The images above are a sampling of subjects linked together by history, science, and metaphysics that have been kept from us all; by the keeping of secrets and the rewriting of history. I have written the book as I was trained to do as an Intelligence Officer with the U.S. Army. An Intelligence Officer briefs the Commander on the enemy. In our case the enemy is the Black Nobles. The Commander cannot operate effectively without trusting the Intelligence Officer. While I can provide massive documentation on subjects discussed, my personal Wonderland experiences are something you will have to believe or not. You will also discover the Rules of Cosmic Reality. With these rules to guide your journey into the Black Noble Matrix, you have the scepter of your own power. The only thing keeping us from evolving into a future of unlimited potential for good, is our ignorance of how the Black Nobles have maintained their control over our Reality. If I have done my job right, by the end of the book you will understand why YOU are the ONE. This book unravels secret history and science, and presents metaphysical principles. It begins with the 1963 Assassination of President John Kennedy. The Kennedy Assassination led to Secret Societies, the Spear of Destiny, the Shroud of Turin and the Resurrection of Jesus. By the end of Book One of the two book presentation, The John Kennedy - Jesus Christ Connection, secret history has revealed links between the death of Jesus and Adolf Hitler, between Kennedy's death and Nazis, between Nazis and Freemasonry, between Kennedy, Khrushchev and Pope John XXIII; and introduces us to the Black Nobles and their control over reality. Meanwhile, the author became a U.S. Army Intelligence Officer and learned the secrets of Electronic Warfare. Understanding energy in its multitude of forms, became the foundation for comprehending concepts ranging from the human bioelectromagnetic field to the geometry of Earth and the Solar System; from telepathy to psychic weapons; from reincarnation to the Resurrection. These subjects are woven thru both books. Book Two, Down the Rabbit Hole, brings in even more first hand experiences, which were critical to the narrative of Book One. By using an autobiographical approach to the subject matter, seeing secrets unfold as the author saw it, lessons in history and science are not only fun, they are journeys into mystery. Those experiences include numerous encounters with extraterrestrials, Archangels and Nature Spirits; experiments with pyramid and other energy devices; demonstrating how mineral energies and sound are the key to good health; longrange telepathy/remote viewing; time travel and memories of past lifetimes. Behind it all is the hunt for the Black Nobles and the matrix of lies that have warped our reality. Who is in control of Reality? How did the Federal Reserve come to dominate the world? Is there a secret Space Fleet, kept hidden because they use free energy propulsion systems? Are there ancient artifacts on the moon and in the desert of Iraq? Is Earth undergoing a massive change because of the Photon Belt? What is HAARP and a chemtrail? Is the sun white? How did the American Republic get taken over by a Corporation, and why is the Founding Fathers' Constitution no longer the Law of the Land? What are Super Soldiers? Why is hemp the ultimate weapon in the return of the Republic? The book takes a leap into metaphysics by delving into concepts of consciousness, energy bodies, the DNA internet, and existence of the soul. And throughout are the teachings of Cosmic Reality and its rules. 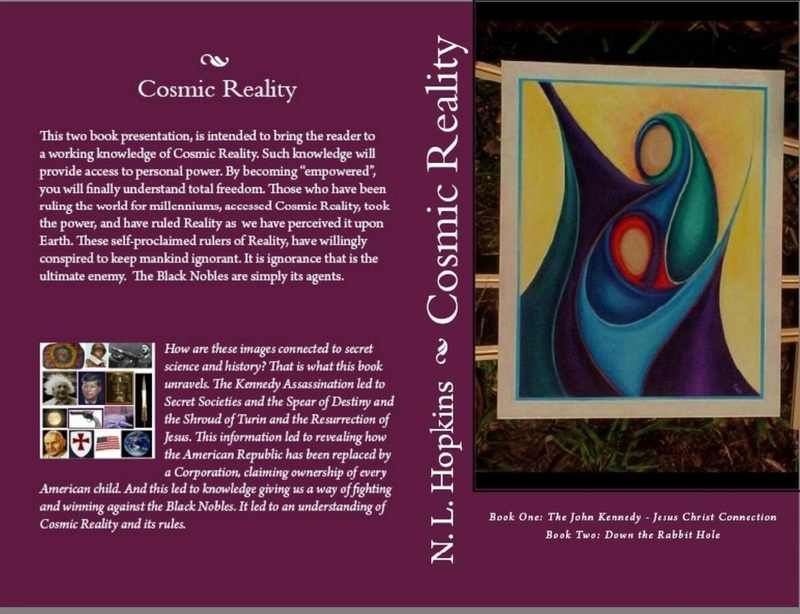 The book brings the reader to a working knowledge of Cosmic Reality. By the end, you should have ample scientific and historic proof that you are a manifestation of your soul. That your soul is a manifestation of something divine. That you have a moral obligation to access the knowledge and power of your soul and its divine counterpart. Such knowledge provides access to personal power. By becoming "empowered", total freedom can be understood. Those Black Nobles who have been ruling the world for millenniums, accessed Cosmic Reality, took the power, and ruled Reality as we perceive it upon Earth. These self-proclaimed rulers of Reality, have willingly conspired to keep mankind ignorant by keeping secret true history and science. It is ignorance that is the ultimate enemy. The Black Nobles are simply its agents. Cosmic Reality provides the key to defeating the Black Noble matrix and insuring a future of unlimited potential and beauty. 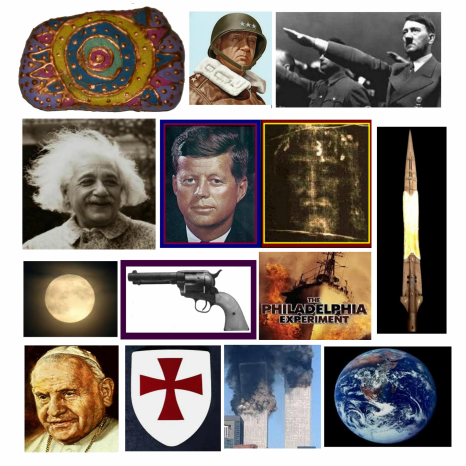 KEY WORDS: Kennedy Assassination, U.S. Intelligence Organization, Paperclip, energy bodies, super-consciousness, long range telepathy, learning telepathy, reincarnation, past life memories, soul connection, ghost, haunting, Time, mediumship, Spear of Destiny, Nazi Secret Societies.